The perfect solution for on-the-go magnification! 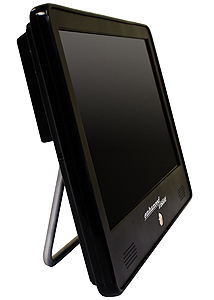 View full-color magnified HD images on a thin, lightweight, battery operated portable monitor. This generous 13.3” display weighs only 3.5 lbs. Easy to set up and ready to use with Enhanced Vision’s Acrobat HD Short and Long Arm, Transformer VGA/USB, Amigo or Max. A slim design allows you to slip this monitor into your backpack, briefcase or bag for effortless transport. One monitor – One magnifier – It’s that simple!